With regard to the overall number of products, it was not surprising equity funds (€437.5bn) held the majority of the assets, followed by bond funds (€166.4bn), commodity products (€18.2bn), "other" funds (€5.2bn), money market funds (€4.5bn), mixed-asset funds (€1bn), and alternative Ucits products (€0.4bn). 2018 was a tough year for the European fund industry. The return of volatility caused by uncertainties coming from a possible trade war between the USA and China, the ongoing Brexit discussions, and a possible return of the euro crisis after the forming of a government in Italy led European investors to reduce the risk in their portfolios. The corresponding transactions led to overall outflows of -€129.2bn from mutual funds registered for sale in Europe over the course of 2018. In contrast to their actively managed peers (-€171.4bn), ETFs registered for sale in Europe enjoyed inflows of €42.2bn and had, therefore, another positive year. 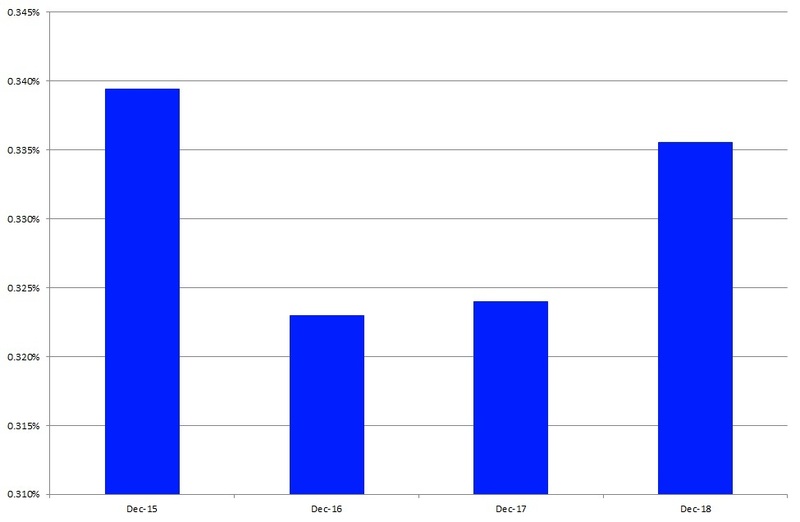 With regard to the fund flow numbers above, some market observers witness a slowdown in the growth of ETFs in Europe. 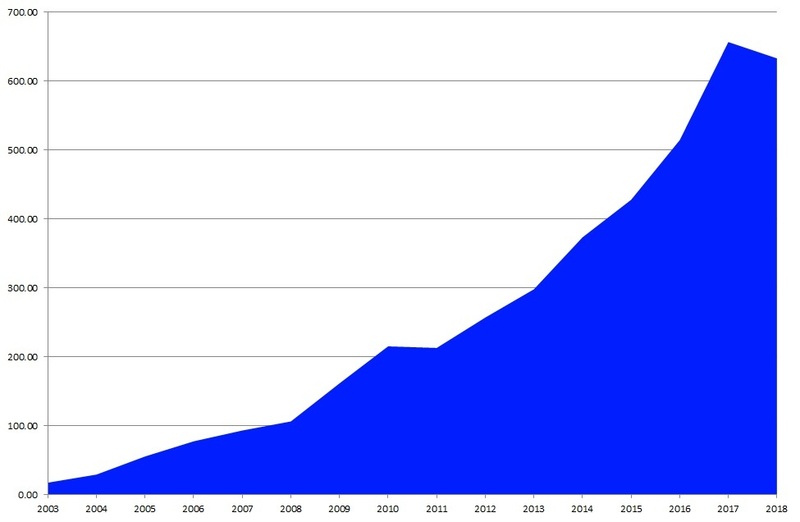 This is true if one compares the 2018 numbers to the inflows in ETF over the course of 2017 (+€94.7bn). 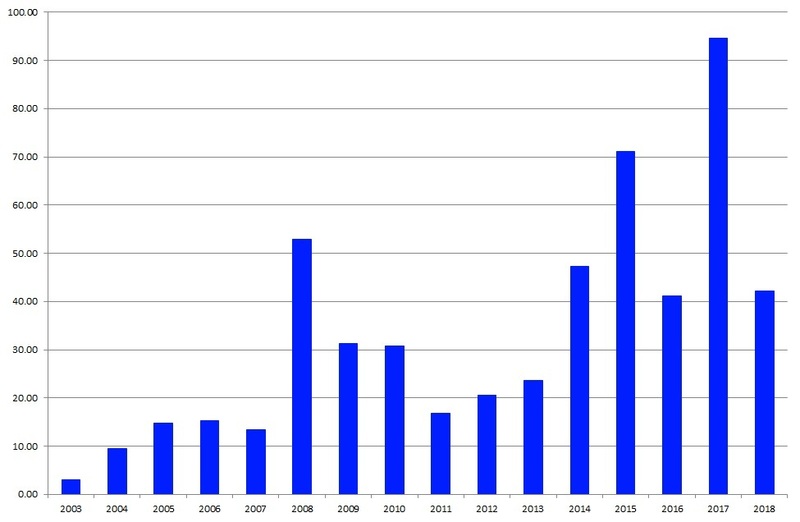 But, in fact, 2018 was the third best year in history with regard to ETF net sales in Europe and, given the fact that 2017 was a record year for both actively managed funds and ETFs, the net sales in ETFs for 2018 look even more impressive since actively managed funds had massive outflows. The inflows into ETFs were quite surprising since investors shied away from mutual funds in 2018 as a result of the ongoing uncertainty in the global markets driven by the new tariff regime in the U.S., a possible upcoming euro crisis (caused by Italy), and a possible no-deal Brexit. Therefore, it was surprising that equity ETFs were the asset type with the highest net inflows (+€27.5bn), followed by bond ETFs (+€14.6bn), money market ETFs (+€1.3bn), mixed-asset ETFs (+€0.4bn) and alternative Ucits ETFs (+€0.003bn). 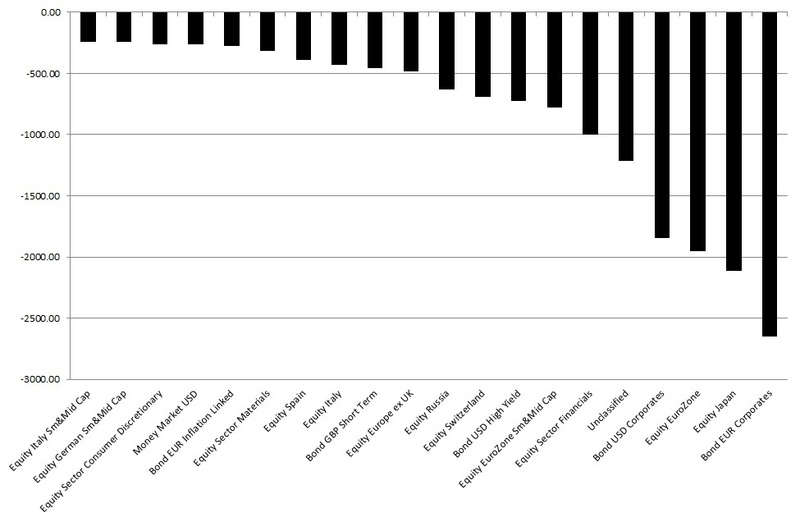 Controversly "other" ETFs (-€1.3bn) faced the highest outflows, bettered by commodity ETFs (-€0.3bn). This flow pattern drove the overall net flows to +€42.2bn for 2018. 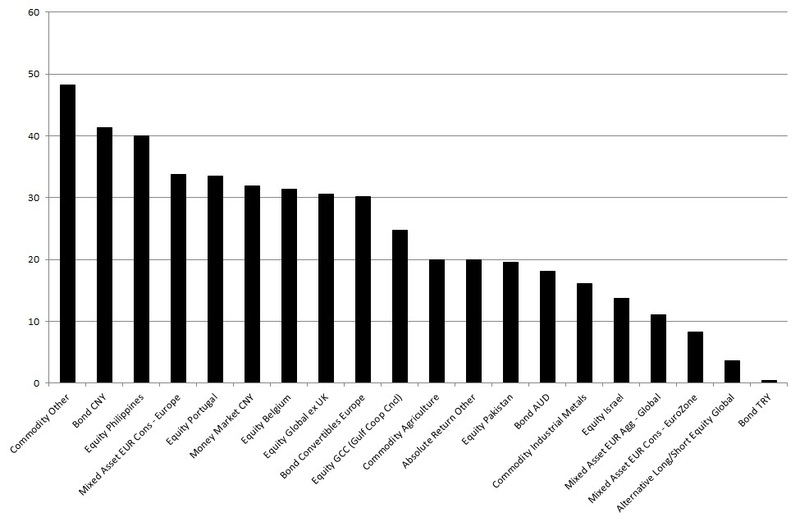 With regard to the Lipper global classifications, the European ETF market was split into 159 different peer groups. The highest assets under management at the end of 2018 were held by funds classified as Equity US (€114.3bn), followed by Equity Global (€57.1bn), Equity Eurozone (€46.2bn), Equity Europe (€34.7bn), and Equity Emerging Markets Global (€32.5bn). These five peer groups accounted for 44.98% of the overall assets under management in the European ETF segment, while the ten-top classifications by assets under management accounted for 58.81%. 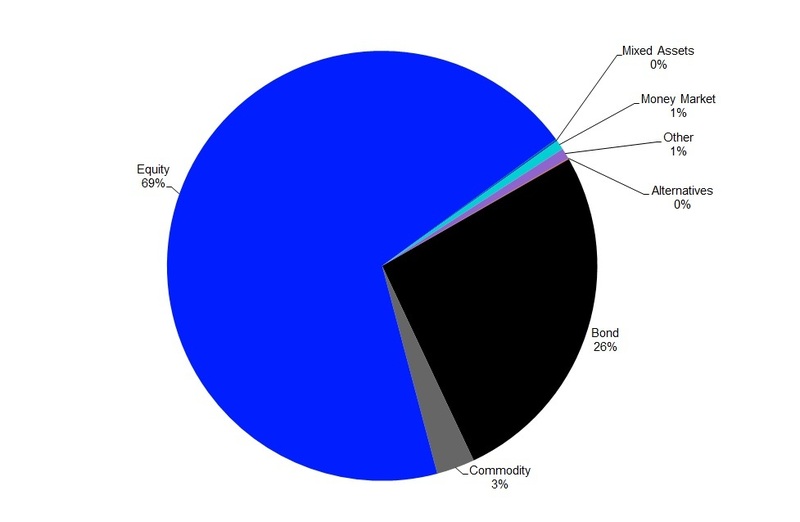 Overall, 19 of the 159 peer groups each accounted for more than 1% of the assets under management. In total, these 19 peer groups accounted for €453.3bn, or 71.60%, of the overall assets under management. 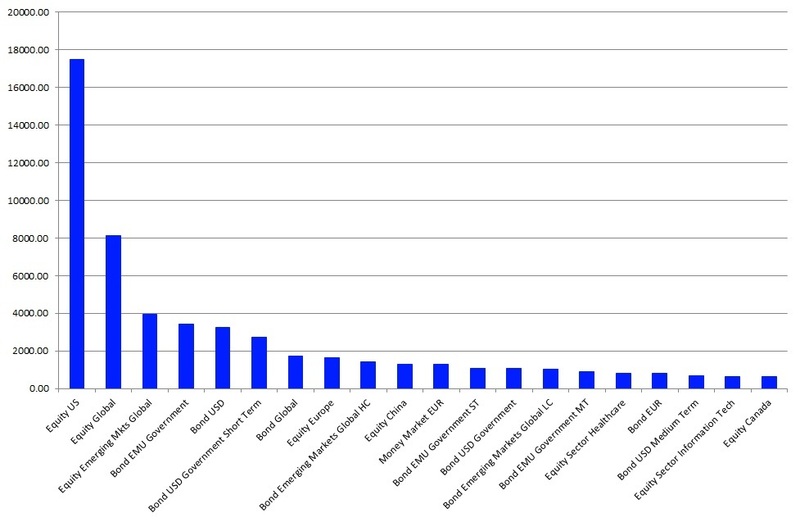 The top 20 peer groups as shown in the chart below accounted for €459.5bn, or 72.58%, of the overall assets under management. 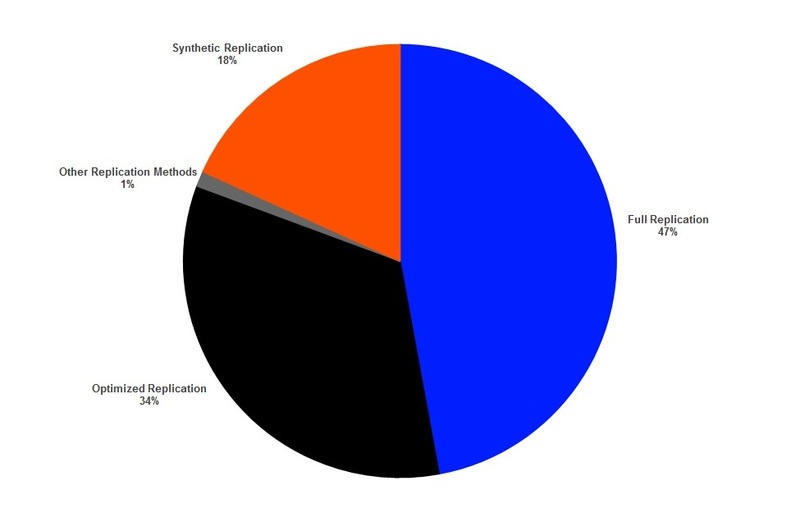 In addition, it was noteworthy that the rankings of the largest peer groups were quite stable, indicating that European investors use the funds from these peer groups as core holdings and not just as so-called satellites that are bought and sold frequently to implement asset allocation views in investors' portfolios. These numbers showed assets under management in the European ETF industry continued to be highly concentrated. With regard to the overall sales for 2018, it was not surprising equity funds (+€34.6bn) dominated the table of the 20 best-selling peer groups by net flows, while bond funds (11) had the most classifications for the peer group count. The best-selling Lipper global classification for 2018 was Equity US (+€17.5bn), followed by Equity Global (+€8.1bn) and Equity Emerging Markets Global (+€4bn). The net inflows of the 20 best-selling Lipper classifications (+€53.9bn) equalled 127.20% of the overall net inflows. 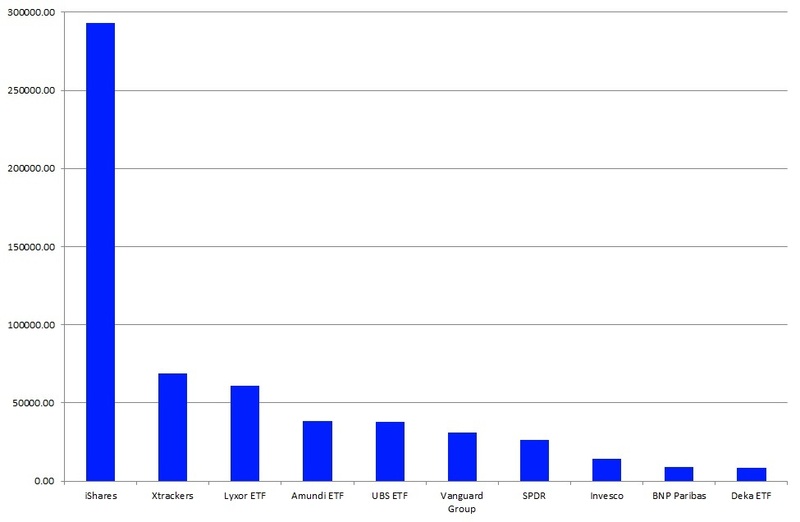 These numbers showed the European ETF segment is also highly concentrated with regard to fund flows by sectors. Generally speaking, one would expect the flows into ETFs to be concentrated, since investors often use ETFs to implement their market views and short-term asset allocation decisions. These products are made, and therefore are easy to use, for these purposes. 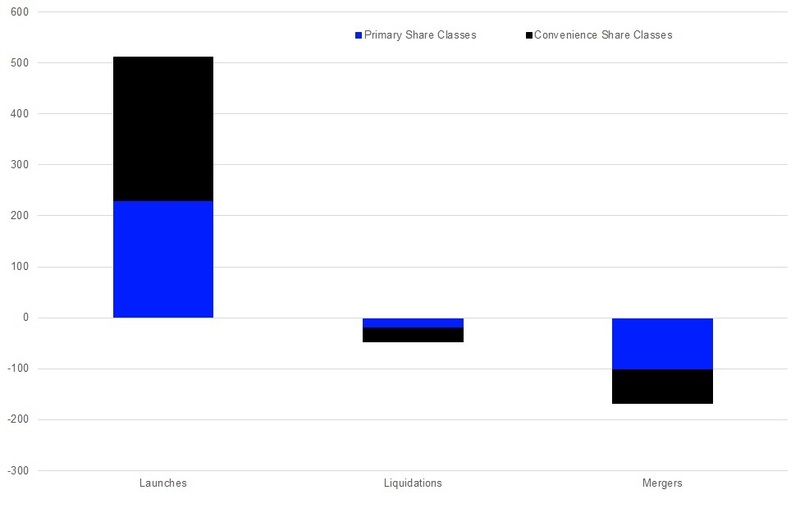 A closer look at the assets under management in the European ETF industry by promoters also showed high concentration, since only 19 of the 50 ETF promoters in Europe held assets at or above €1bn each. The largest ETF promoter in Europe—iShares (€293.3bn)—accounted for 46.32% of the overall assets under management, far ahead of the number-two promoter Xtrackers (€68.8bn) and the number-three promoter Lyxor ETF (€61.1bn). (To learn more about the concentration of the European ETF market at the promoter level, please read our report: Spotlight on the concentration at the promoter level in the European ETF industry). 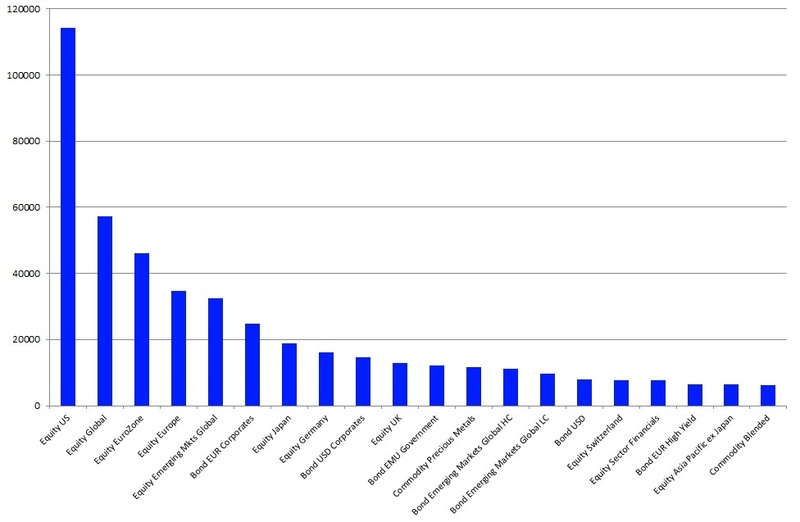 The ten-top promoters accounted for 93% of the overall assets under management in the European ETF industry. This meant, in turn, the other 40 fund promoters registering at least one ETF for sale in Europe accounted for only 7.00% of the overall assets under management. 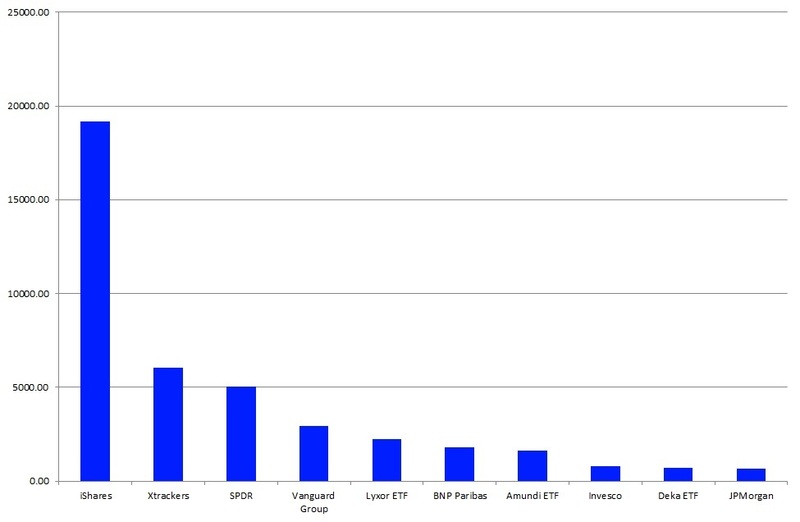 Since the European ETF market is highly concentrated, it was not surprising that nine of the ten largest promoters by assets under management were among the ten-top selling ETF promoters for 2018. iShares was the best-selling ETF promoter in Europe for the year (+€19.2bn), well ahead of Xtrackers (+€6.1bn) and SPDR (+€5.1bn). Since the flows of the ten-top promoters accounted for 96.57% of the overall estimated net flows into ETFs in Europe for 2018, it was clear that some of the 50 promoters (15) faced net outflows (-€2bn in total) over the course of the year. The drivers behind the increase in the average TER were alternative UCITS ETFs, for which the TER increased 8 basis points to 0.33%, and money market ETFs, which saw an average increase in the TER of 4 basis points up to 0.17%. 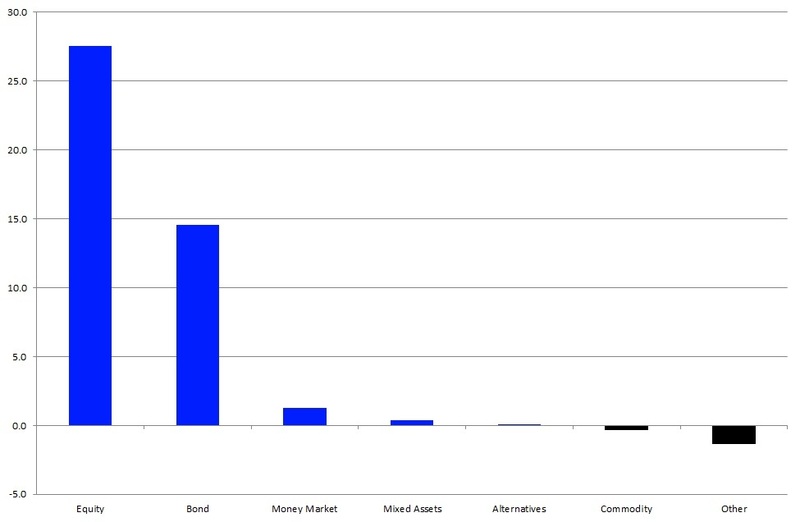 In addition to this, the average TER for bond ETFs (0.23%) and "other" ETFs (0.40%) increased by 1 basis point. Opposite to this, the average TER for mixed-asset ETFs (0.43%) came down 4 basis points, while the average TER for commodity ETFs (0.41%) fell by 1 basis point. 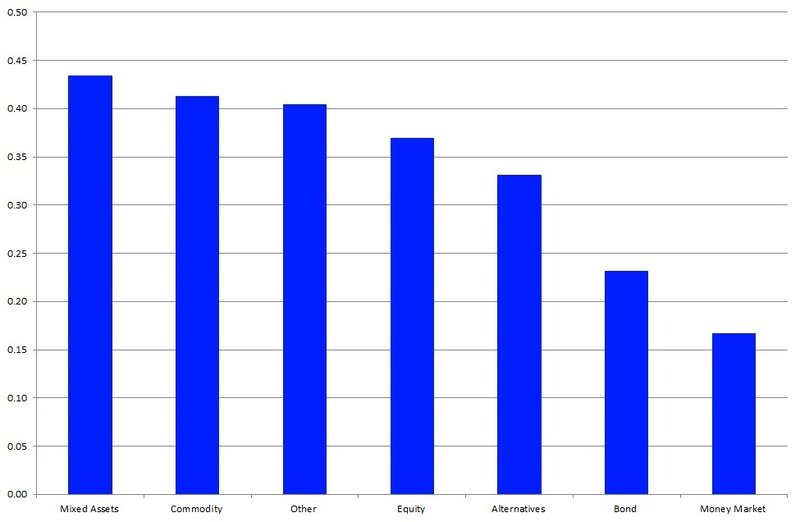 A detailed view of asset class level shows equities were the asset type with the highest level of activity among European fund promoters over the course of 2018, followed by bond ETFs and "other" ETFs. 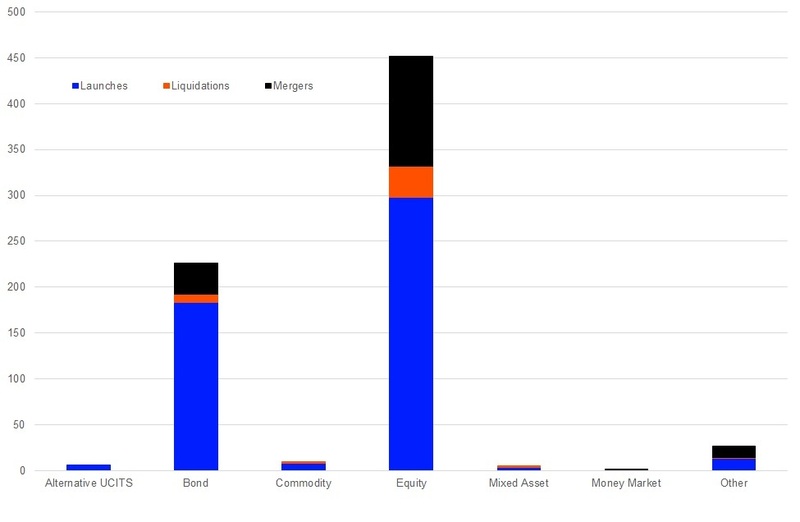 This pattern is not surprising, since equities is the leading asset type in Europe by number of products and assets under management.